Florida Boating Safety Education ID Cards are replaced by the FWC at no charge. For a replacement card, please contact the Florida Fish & Wildlife Conservation Commission Division of Law Enforcement at 850-488-5600, or e-mail the FWC at [email protected] for further instruction. Get Your Florida Boating License Online! Boating License or Boater Safety Education ID Card... is there a difference? 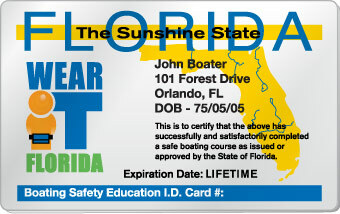 The boater education card is proof that you have successfully completed a boating safety course. The boater education card does not expire and does not need to be renewed. Therefore, it is NOT a Florida Boating License!